Project Play began as a national initiative. Today, it's also very much a deep dive into youth sports at local levels. Project Play has model communities (Baltimore, Harlem) and regional initiatives (Southeast Michigan; Western New York; Greater Rochester; Mobile County, Alabama) that are directly helping communities build healthier outcomes for kids. Our first model initiative, Project Play: Baltimore identified and facilitated opportunities for leaders to grow the quality and quantity of youth sport opportunities. Our specific focus was on a two-square-mile area of East Baltimore, where Under Armour helped renovate a recreation center in 2016 and asked us to assist stakeholders throughout the area. USA Swimming Foundation and Baltimore City Recreation and Parks (BCRP) collaborated to teach youth necessary swimming skills and water-safety tips. 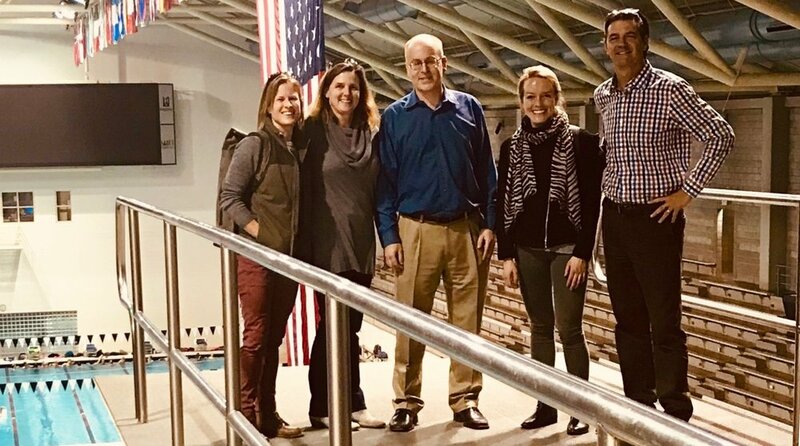 Additionally, BCRP is now a Make a Splash Local Partner of the USA Swimming Foundation, making them eligible for gran ts up to $15,000 to support their swimming needs. Project Play: Baltimore supported Banner Neighborhoods Community Corporation in developing sports leagues and becoming a Year One recipient of the Baltimore Children and Youth Fund with a $290,000 grant. Banner was selected as a member of the inaugural class of Project Play Champions. Project Play: Harlem is a multiyear initiative focused on five-square-mile area of New York City. With the support of Harris Family Charitable Foundation, Laurie M. Tisch Illumination Fund and Mount Sinai Health System, the Aspen Institute is assessing the state of play in the largely Latino community and helping to mobilize civic, youth and sport groups. Inspired by Project Play: Harlem’s Community Rec Group Roundtable, New York Road Runners connected with three East Harlem sport and recreation organizations. They partnered to offer active sport sampling sessions on the field and/or set up information booths during their annual Jamboree Presented by TATA Consultancy Services, engaging over 1,000 youth from across New York City to participate in runs, walks and fitness activities. Facilitated the creation of and supported the outreach of an East Harlem Community Sport Program Portal with NYC Sports Connection. The portal is a citywide sports listing platform and forum for the youth sports community. Supported DREAM in its Project Play Champion commitment to expand sport options for children based on their expressed interests. A new, full-time staff member has been dedicated to programs for elementary-school age children and will introduce up to five programs that are not currently offered. Inspired East Harlem Tutorial Program to survey youth about afterschool and summer programming. Project Play: Southeast Michigan works across seven counties, seeking both community-wide and stakeholder-specific input to collaboratively build local solutions that address a goal of “building communities in which all children have the opportunity to be active in sports.” The initiative is a collaborative project between the Ralph C. Wilson, Jr. Foundation, the Community Foundation for Southeast Michigan, and the Aspen Institute. Project Play works with the four YMCAs active in the region to support the development of a YMCA Positive Play Initiative (YPPI) to expand free play and sports sampling opportunities. Community relations and foundation staff of the Lions, Tigers, Pistons, and Red Wings have joined a work group to support efforts that expand access to sports and play, starting with the Pistons’ Basketball for All program. The Institute for the Study of Youth Sports (ISYS) at Michigan State University is conducting a deep dive into coach training, with the support of the Project Play: Southeast Michigan coach training work group. Project Play: Western New York is a nonprofit initiative launched by the Ralph C. Wilson, Jr. Foundation through the Community Foundation for Greater Buffalo and with the support of Aspen to ensure kids in the eight-county Western New York region have the opportunity to be active through sports and build physical literacy. The initiative has convened working groups to regularly engage over 50 community leaders in key priorities, including coach training, sports sampling, free play, and building capacity. Project Play Champions, Algonquin Sports for Kids and Victory Sports Global Outreach, along with local libraries and park systems, are developing an equipment sharing and lending program to expand access to free play and sports sampling opportunities. Track and field coaches and officials have been meeting to strategize the return of recreational summer track and field meets. Stakeholders on Buffalo’s East Side have partnered to redevelop a former YMCA, used by the African-American community, into a community center and youth sports complex. Aspen supports the Rochester Area Community Foundation as it activates State of Play: Greater Rochester & the Finger Lakes in Livingston, Monroe, Ontario, Seneca, Wayne, and Yates Counties. The Rochester Area Community Foundation has completed their first round of Legacy Fund grants in Youth Sports, awarding $329,000 to 20 organizations that together serve over 6,500 kids. Rochester Challenger Miracle Baseball, highlighted in the report, received a grant of over $400,000 to build out and operate Rochester’s only adaptive youth baseball park. The State of Play report noted that “Greater Rochester and the Finger Lakes have the ingredients to be a hub for action sports.” With funding support from the Tony Hawk Foundation and the State of New York, the city council unanimously approved the construction of the $2 million Roc City Skatepark. The city of Rochester is creating a Corridor of Play, connecting the Strong Museum of Play to the city’s Riverway with fun, free play elements for families. In 2018, the Aspen Institute partnered with the Community Foundation of South Alabama, the Jake Peavy Foundation, and the Caring Foundation on State of Play: Mobile County. This initiative was designed to help close the opportunity gap for youth sports in Mobile County, Alabama, where child poverty is at a staggering high. The Aspen Institute and local community leaders worked together to conduct a regional assessment of the landscape of youth sports in the community and produced a State of Play report that identifies key findings known to get and keep kids active in sport and provide recommendations for next steps. In 2019, the Aspen Institute will produce a report landscaping youth sports in Hawai‘i. The project is in partnership with the Lili‘uokalani Trust, a private operating foundation for the benefit of orphan and destitute children with preference given to Native Hawaiian children. Sports is and has always been a huge draw for Hawaiian children. Not a weekend goes by where you won’t see the majority of parks teeming with bright colored jerseys, screaming parents and smiling children. Drive down any street, in any Hawaiian neighborhood, on a weekday afternoon and you’ll see countless numbers of pick-up football, basketball and even baseball games being played by children as young as 5 or 6. The report will be released around the 2019 Project Play Summit and identify areas that the Native Hawaiian population and in particular, Kamaliʻi, can take greater advantage of sporting across the state as a continued lifestyle. Also in 2019, the Aspen Institute will landscape youth sports in Seattle and King County. The project is in partnership with the University of Washington and King County Parks, along with the YMCA of Greater Seattle, Seattle Mariners and Kaiser Permanente, in an effort to prioritize equal access to youth sports. Seattle was the fastest-growing U.S. city in 2017, with 1,000 newcomers arriving every week. The population boom brings increased pressure on infrastructure, including the area’s shared spaces for play and sport. With access scarce, many travel teams are able to rent space for fields and community centers, leaving lower-income youth behind for what’s supposed to be shared spaces. Only 29 percent of sixth-grade youth in King County get the recommended level of physical activity, and this drops to 18 percent by the 12th grade. Hispanic and Pacific Islander youth are almost twice as likely to be overweight compared to the King County average. The report will be released around the 2019 Project Play Summit. Listen to Tom Farrey of the Aspen Institute and Julie McCleery of the University of Washington Center for Leadership in Athletics discuss inequities for youth sports in Seattle.